Summer is here and The 99 Cent Chef has a Mexican veggie dish made with a bounty of summer squash. It's a spicy, comfort food, dish often ordered by my wife at a local Hollywood Mexican restaurant, and shared over a happy hour of frosty margaritas. My local Latin market has overflowing bins of light green and white speckled Mexican squash, and deep green zucchini. If your local farmers market is carrying yellow crook-neck squash, use it. Mix in a few squash types for more color and flavor. 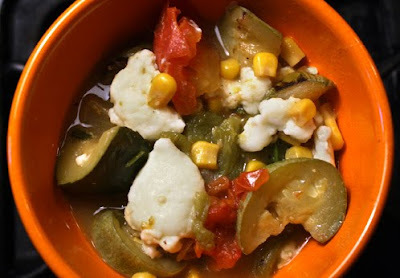 Along with squash, all you need is an onion, corn (fresh or from a can), tomatoes, a can of mild green chiles, cilantro, and finally, some melting cheese as a topping. Choose a cheese that is firm, like Jack, mozzarella, Swiss, mild cheddar, or my favorite, Mexican Queso Fresco (avoid processed American cheese; it will melt into a soup - save it for a grilled sandwich). 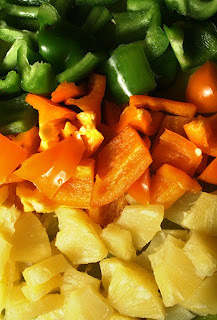 The preparation is simple: a little chopping and sauteing, then cover and cook for 15 minutes. And this dish is also delish in a corn tortilla as a vegetarian taco. Start your summer with Calabasitas -- my delish, budget veggie dish; and use your saved nickles and dimes for that upcoming 4th of July steak barbecue! 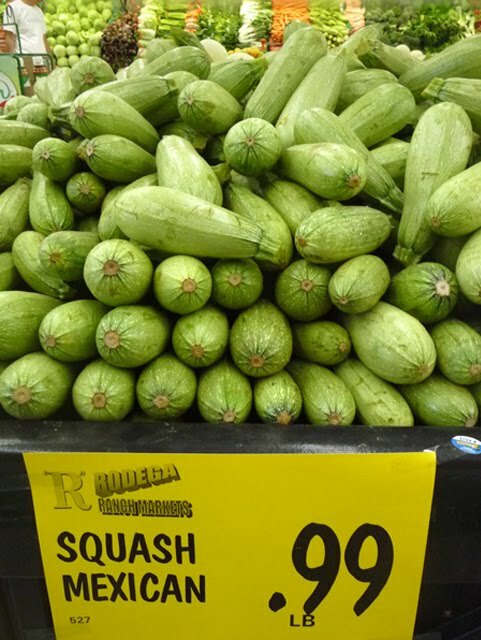 2 Mexican squash - chopped, okay to use yellow crook neck squash. 1 large whole tomato - or 2 to 3 smaller ones. 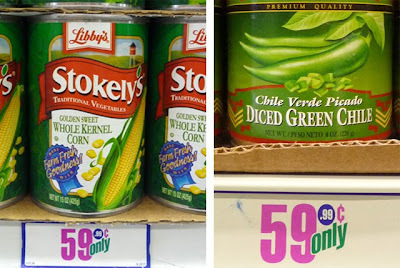 1 small can of yellow corn - about 8 oz. & drained. Frozen corn or one ear of fresh corn. You can remove kernels, or break cob into 3 or 4 segments. 1 small can of mild green chiles - about 8 oz. drained and chopped. 1 tablespoon garlic - chopped. 1 to 2 cups of water - depends how soupy you like it. Add a chicken bouillon cube for extra flavor. Or keep it vegetarian and add a favorite veggie broth. You can even leave out the water for a thick stew. 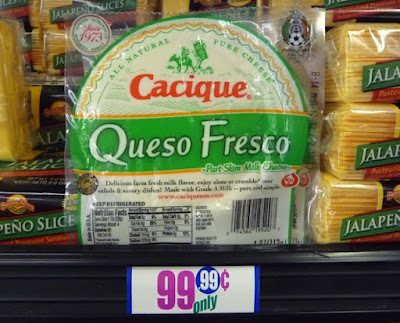 Cheese for topping (when done), such as Queso Fresco, Jack, mozzarella, mild cheddar, or Swiss. 1 tablespoon of oil for sauteing. 1/2 cup of chopped cilantro - optional. Roughly chop veggies, including: squash, zucchini, onion, garlic and tomato. If canned green chile is whole, then roughly chop. 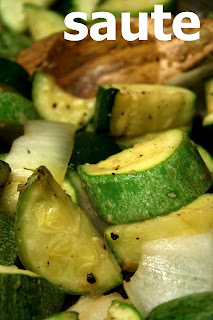 Over medium heat, in a pan or pot, , heat oil, then add chopped onion, squash, zucchini and garlic. Saute for 5 - 10 minutes until soft. 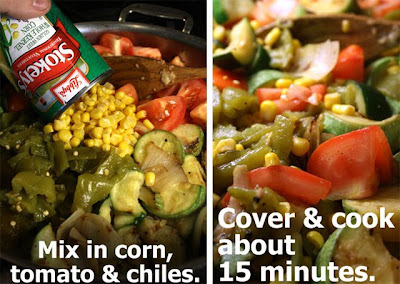 Finally, mix in the rest of the ingredients (except cheese), including: chopped green chiles, tomato, cilantro and drained corn. Add 1 to 2 cups of water or favorite stock (optional.) It's even okay to leave out the liquid. Season with salt and pepper. Cover and reduce heat to low and cook for about 15 minutes. If you are not using water, the veggies will render out liquid to create a rich broth. Finish Calabasitas by topping each steaming bowl with a handful of cheese (if it's typical fast-melting.) Queso Fresco has a high melting point, so I add it during the last couple of minutes of cooking. 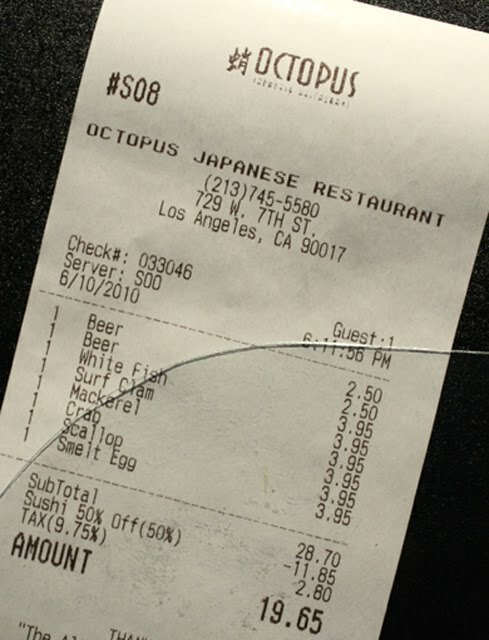 If there is a better and cheaper sushi deal in L.A. please let me know! 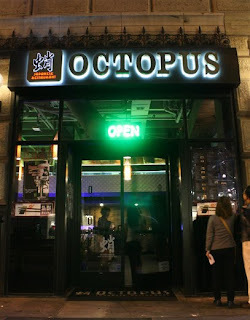 For now I will have to settle for the half priced sushi Happy Hour at Octopus Japanese Restaurant in Downtown -- a few steps from the Metro's 7th Street subway station. Stepping through the front door, loaded down with my tripod, camera and the L.A. Weekly (while waiting for the sun to set so I can shoot more of my Restaurant Nocturnes Series), I find tables and window booths filled with well- dressed, rowdy office workers, just belched out of skyscraper elevators, slamming down 22 oz. bottles of Kirin Beer. To add to the cacophony, the L.A. Lakers are heading to another championship, playing out on an overhead flat-screen at one end of the almost empty sushi bar. It's only six p.m. on a Thursday. I sit at the bar, where I am quickly handed the Happy Hour menu, and request the first special of the day: an ice-cold 12 oz. bottle of Sapporo beer for $2.50. 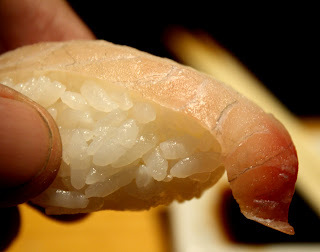 For this tasting review, I decide to order only sushi that costs less than $2 -- there are almost a dozen varieties to choose from, including: whitefish, surf clam, mackerel, shrimp, crab (fake, or 'krab'), squid, scallop, bean curd, egg (cooked), smelt egg and quail egg (raw). That's plenty for an excellent and varied sushi experience. 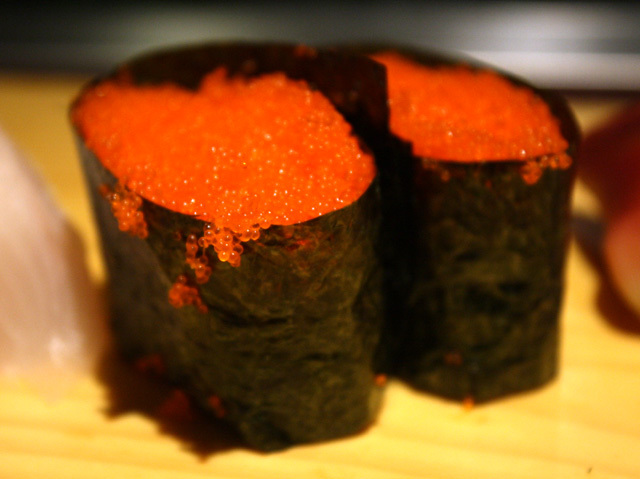 If you want to indulge in Uni (sea urchin), you'll have to pay the full price of $6.50 (for L.A.'s best Uni deal I suggest you watch my Chasing Sea Urchin video by clicking here). I start with Scallop (Hotategai), Smelt Eggs (Masago), and Mackerel (Saba) Sushi. 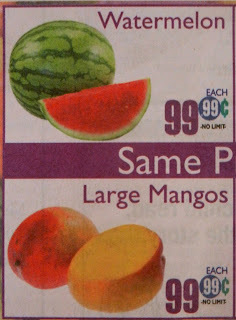 Each order comes with two pieces and cost $1.98 per order -- that's 99 cents per piece! 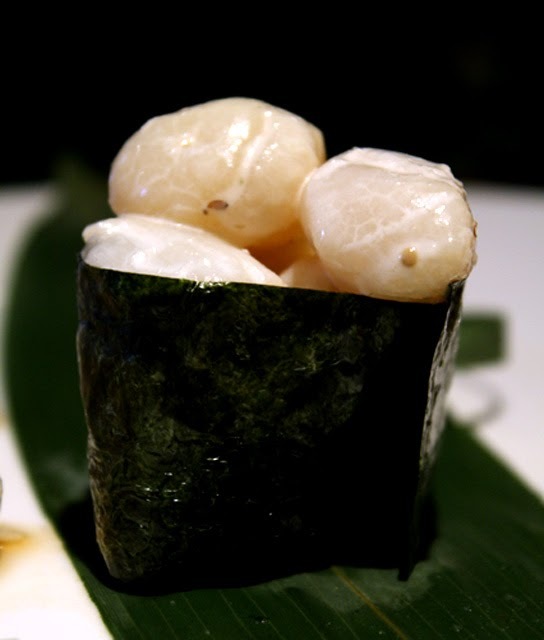 My Scallops are piled high -- plump pearls that spill over a deep green, Richard Serra sculpted, nori-wrapped wall. A light mayo mixture, with a sprinkle of sesame seed, complements their soft texture and mildly sweet ocean flavor. There are enough small bay scallops for plucking out with your chopsticks, and luxuriate in, before scarfing down the whole thing. It's a great start. Next up is fluorescent orange Smelt Egg Sushi, which releases pop-rock-like mini-explosions of salty fish pellets with every bite. Compared with caviar, smelt eggs are so much smaller and subtler in flavor. It's fun to press the tiny grains against the roof of your mouth with your tongue to savor all the briny/sweet flavor. 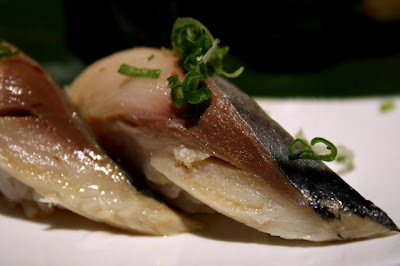 I'm happy to discover that Octopus also serves an excellent Mackerel (Saba) Sushi, always a favorite. It comes in two large silvery slices, the pungent, fatty marbled dark flesh, topped with vinegary minced green onion, laying over and beyond the ovals of white sticky rice. I could stop right here, and I do -- at least long enough to order another Sapporo Beer and watch a bit of the Lakers playoff game. I would come back just for the Mackerel Sushi and Japanese beer. Plunging on after my respite, I order Whitefish (Hirame) and fake Crab (Kani) Sushi. These prove to be my least favorite bites, but they're not bad. The texture of Whitefish is not as creamy as Yellowtail (Hamachi) Sushi ($2.75) and the flavor is a bit bland. What is there to say about fake Crab? Fine for desperate times. It's not a big loss, as I'm ordering cheap today -- so you win some, lose some. 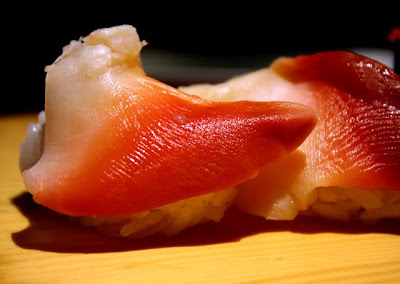 I finish up with Surf Clam (Hokkigai ) Sushi. So strange looking -- it's like a rubber devil's claw. Clam this large is usually chewy, but I find Surf Clam surprisingly tender and easy to eat. It has a mild taste with a hint of ocean salt. The pieces are almost too large to eat in one bite. It makes an interesting finish to a great Downtown L.A. Sushi Happy Hour. My bill, including 2 beers and tax, comes to $19.65. At Octopus, all the sushi is made to order, fresh-tasting and well presented in a fun atmosphere. And if you sit in a spotlit seat, you can read Jonathan Gold's "Counter Intelligence"and plan out your next day's entertainment while perusing the freshly printed Thursday edition of the L.A. Weekly. For website Happy Hour menu, click here. Other locations include: Glendale, Burbank, Brea, Encino, and Irvine - call ahead for their Happy Hour details. What to do with all those dried prunes when you become "regular" again? Try the Chintzy Constive Chef's Moroccan Chicken recipe, of course. Combine easy-to-get pungent Middle Eastern spices like paprika and cumin, then fold in creamy yogurt, with a sprinkle of dried nuts, and finish with dried prunes (which sweeten this baked chicken entree). It's a heady, complex mix that's immensely satisfying and cleansing. For a more interesting texture I added some nuts that you can get at your local liquor store. 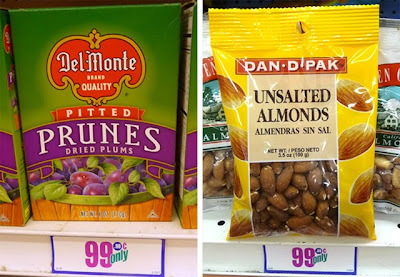 Peanuts work well, and my local 99c only Store also carries small packages of almonds, cashew pieces, and pistachios. For this recipe I used roasted almonds. Any local nuts will work. Moroccan Chicken is assembled in a minute, then baked in the oven for an hour and a half -- done and ready to serve with minimal effort, but maximum flavor. 3 chicken leg quarters - about 3 pounds. Okay to use any chicken pieces. 6 - 7 ounce package of pitted prunes - if you use prunes with pits, be sure to warn fellow diners! 1 small container of yogurt - optional. About 6 oz. Since you are cooking with fruit, any type of yogurt is okay. 3-4 oz. package of nuts - optional. Any type, I used roasted almonds - peanuts, cashews and pistachio are good. 1 tablespoon of garlic - chopped. 1 cup of stock (or water) - vegetable or chicken. 1 tbsp. powered ginger - optional. Salt and pepper to taste - if nuts are salted, then leave it out. In a large pot add chopped onion and garlic. Sprinkle on seasonings, including: cumin, paprika, salt and pepper. 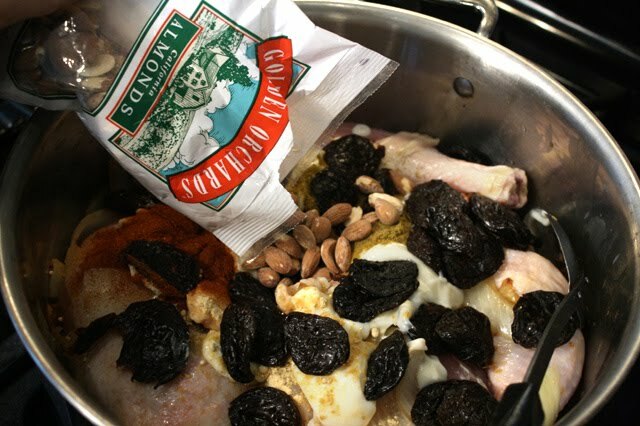 Add prunes, yogurt and water or stock - mix well. 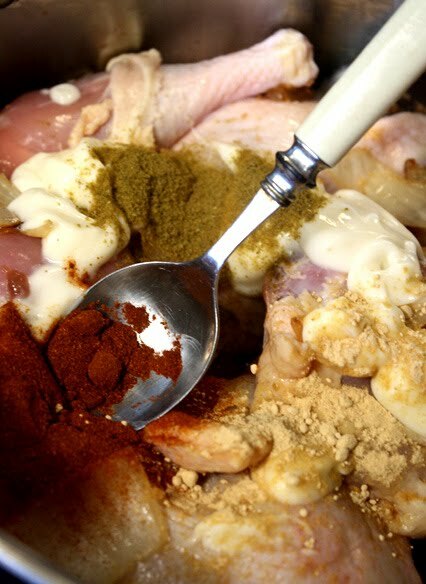 Place chicken pieces on top and spoon liquid mixture over chicken. Baste chicken with sauce a few times during baking. With the chicken on top, it will brown nicely. When done, remove from oven and skim off some fat if you want to. If you are using breast meat only, then reduce baking time by 15 minutes. * I was introduced to Chicken with Prunes by our friend Stacey. She made it simply with chicken, prunes, liquid (white wine or stock), salt and pepper. You can do this too. 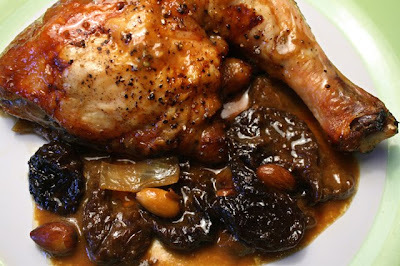 Just add a cup of stock to chicken pieces and prunes, then season, and bake uncovered an hour. It will taste delish. 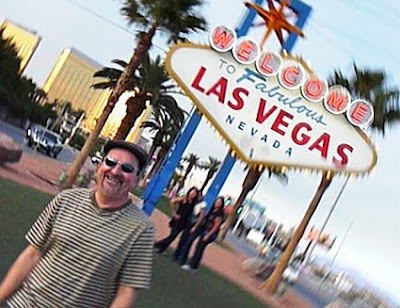 What happens in Vegas stays in my blog! Bright lights illuminating skyscraper casinos that never close, slot machines in gas station mini-marts, an elusive 99 Cent Shrimp Cocktail, and panning for gold are all featured in The 99 Cent Chef's latest travel video. The Chef is not a gambler, except in the kitchen where anything goes! So tag along as my wing-man for a jackpot of chintzy carousing. While all the tourists are being scalped with $40 all-you-can-eat buffets and $200 tickets to see Cher, I'll show you a swinging good time with the "Rat Pack Is Back" stage show (Frank, Sammy, Dino and Joey are funny and tuneful), accompanied by a big band and served with a New York Steak dinner (including salad and dessert) -- all for 30 smackers! Let me give it to you straight - this tightwad's secret to low-cost partying is Fremont Street, nicknamed Glitter Gulch, in old downtown Las Vegas. Clogged mega-hotel lobbys and crosswalks from the Luxor to the Bellagio on Las Vegas Boulevard? Forget about it! Fremont Street has all the great deals I'm looking for, including 99 cent Margaritas at Fremont Hotel and Casino. 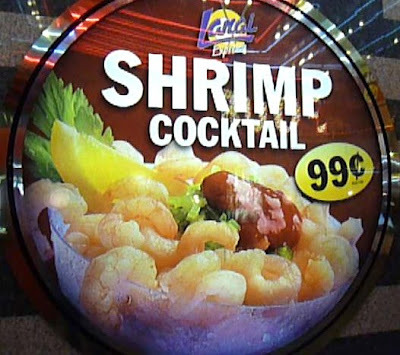 And my Vegas video features a candid 99 Cent Shrimp Cocktail review. On Fremont Street the casinos are side by side and the street is closed to cars (like the Promenade on 3rd. Street in Santa Monica.) 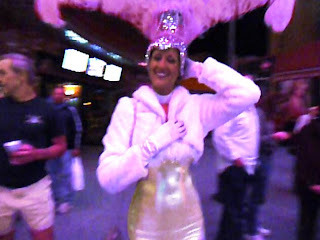 Showgirls and Elvis imitators rub elbows with everyone else under a covered promenade several city blocks long that features video collages overhead every half hour. It's noisy, raucous and outrageous. Casino betting limits are lowered here to pennies and dimes. The drinks taste watered down like everywhere, but you don't feel stiffed because the prices are cheaper. My video wraps up with an outrageous golden nugget gambling sequence that deals you a comedy royal flush! Odds are in your favor when the Master Miser Chef bankrolls you his comp video. And you can double down on his Vegas inside bet bargains! Play it here. The video runs 5 minutes 43 seconds. Lanai Express's 99 Cent Shrimp Cocktail: yelp reviews here. 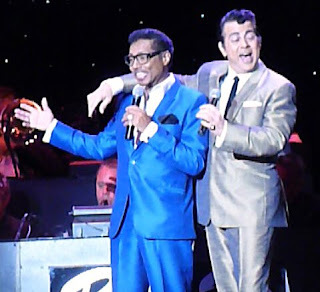 Rat Pack is Back at the Plaza Hotel: click here. Website price is advertised at $49.99 -- a broker on the strip (next door to the McDonalds with flashy neon sign) was selling them for $30. Ticket price includes Salad, New York Strip Steak and Dessert (Martinis are extra). Ticket buying tips: click here. Gold Spike Prime Rib Dinner $5.99: click here. Website for drink & dining specials in and around Las Vegas: click here. Fremont Street Blog with info: click here. 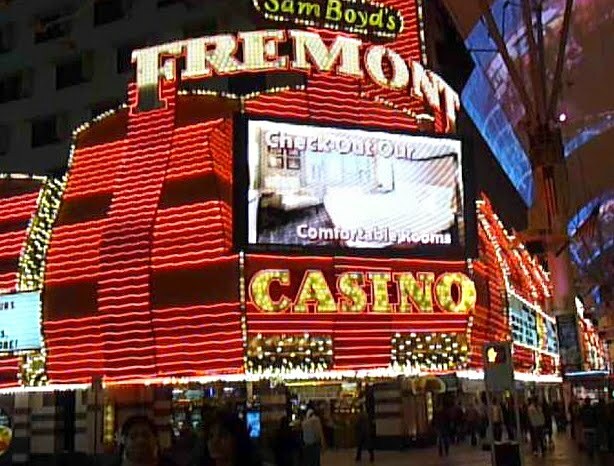 Hotels on Fremont Street are much cheaper than on Las Vegas Boulevard. Let this be your first salad of summer. Light and sweet, these three fresh ingredients are coming in on sale now. 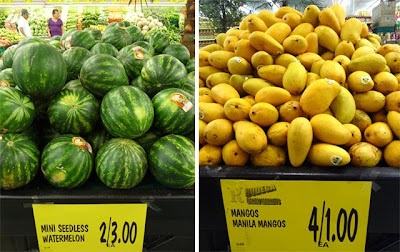 At my local Latin market & 99c only Store I picked up small, sweet, Manila mangoes and seedless mini-watermelon for 99 cents or less. I first had this salad only a few weeks ago at an after-party for a screening of HBO's "A Special Relationship" (About Tony Blair and Bill Clinton's stormy friendship - a memorable scene takes place, at Britian's 10 Downing Street, of Bill Clinton raiding Tony Blair's refrigerator, almost worth the price of a HBO subscription! ), at the Director's Guild on Sunset Boulevard. It was quite a spread -- mixing British and American cuisines, including: Fish & Chips, Sliced Beef Sandwiches, Mac & Cheese, Fried Chicken, Mini-Shepherd's Pie, and, most memorably, Watermelon, Mango and Baby Spinach Salad (that was worth a trip for seconds). The movie was good and the food was terrific. Soon after, I made my own version with chopped regular spinach (baby spinach is harder to find and usually more expensive) for an outdoor party thrown by our neighbors Bob & Lori for their new baby, Lola. It was gobbled up almost immediately, so I know you will like it! 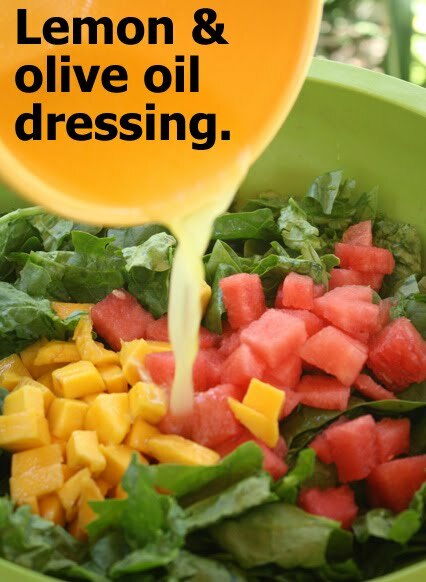 You can use any light salad dressing you have on hand to mix into the salad -- or make a simple lemon juice (or orange juice) & olive oil dressing. 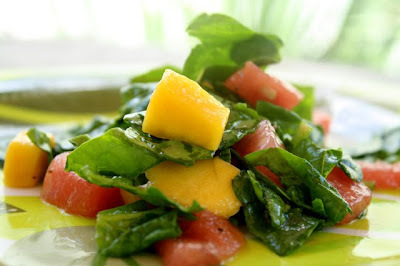 So try out this scrumptious summer salad made with budget and fresh Latin market ingredients. 3 cups of watermelon - cut into bite-sized pieces. I used seedless for the convenience. 2 cups of mango - peeled and cut into bite-sized pieces. Okay to substitute canned, drained, pineapple. 1 bunch of spinach - washed and chopped roughly. 3 tablespoons of olive or vegetable oil. Juice of whole lemon - lemon or lime juice from jar is fine, about 1/4 cup. Okay to substitute orange juice. Okay to substitute with a favorite store bought light salad dressing. 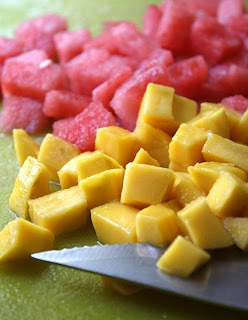 Chop watermelon and mango into bite-sized pieces. Wash well and cut off stems of spinach. Chop roughly. Add all to a large salad bowl. In a small bowl whisk together lemon juice, olive oil and salt. Pour into salad bowl and mix well. If you have a light salad dressing on hand, it is fine to use that instead. Chinese food is cheap, and my latest recipe is too. The sweet and sour sauce is just ketchup, sugar, soy sauce and vinegar; stir-fry a few veggies and mix in the pork, that's it. The hardest part is deep frying the pork, but you can just stir-fry it (without the batter), to do an even simpler, lighter, version - that tastes just as good. While Sweet & Sour Pork is not my first choice in a Chinese restaurant buffet line - I always grab some on the second go around, though. It is a versatile dish. You can use any crunchy vegetables you have on hand, including: celery, carrot, onion, broccoli, and the usual bell pepper and canned pineapple. 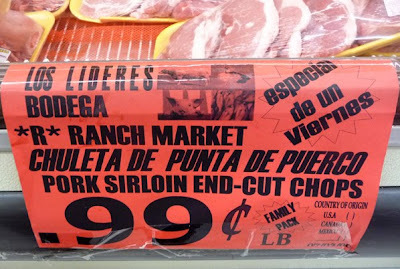 I've been buying pork end-cut sirloin lately at my local Latin market for 99 cent per pound. 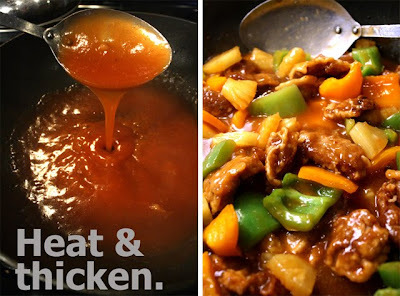 You can also make Sweet & Sour Chicken using bone-in breast meat - it's a good deal, and easy to separate and chop (dark meat takes more work, but I've done it). 1 pound of pork sirloin, chop, or country-style rib - trim off fat, and cut into one inch pieces. Okay to substitute chicken. 1 small can of pineapple - if rings, then cut into cubes. Reserve juice for sauce. 1/2 cup of pineapple juice - add some water if you do not have enough juice. 1/4 cup of vinegar - white, rice or apple cider vinegar. 1 tablespoon of sugar - for pineapple in sweet syrup, leave out sugar. 1 tablespoon of cornstarch or flour - stir and dissolve into pineapple juice and/or water. 3/4 cup total of cornstarch and flour, mixed together - you can use flour only. While 2 cups of oil is heating in a wok, or deep frying pan, mix batter ingredients in large bowl. It should be similar to pancake batter when mixed together. Salt and pepper cubed pork. When oil is hot (about 350 degrees, over a medium/high heat), start out by adding one battered piece to make sure oil bubbles when it's added. 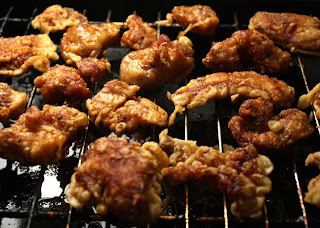 Mix in cubed pork into batter, a few pieces at a time, coat well, and carefully add to hot oil. Don't overload wok, fry in batches, then drain on a wire rack or paper towels. Allow oil to cool, then drain out. I save the oil for French frying at another time. While fried pork is draining, cut bell pepper into one inch pieces - make sure to remove stem, seeds and white membrane inside the bell peppers. Drain canned pineapple (reserving juice for sweet & sour sauce), and chop into cubes. You can use any crunchy veggies you have on hand for this recipe. For the sweet & sour sauce: in a bowl, dissolve sugar and cornstarch in 1/2 cup of pineapple juice and/or water. Add rest of ingredients including: ketchup, soy sauce, and vinegar. Mix well. Now it is time to put it all together. Over medium heat add sweet & sour sauce to wok, or a large pan. Sauce should thicken quickly, in a couple of minutes. Next add veggies and pineapple. Mix well until heated through, another couple of minutes. Finally add deep-fried pork (or chicken). Carefully mix (you don't want the batter to fall off meat) and heat through for 2 more minutes. Serve over rice or noodles. 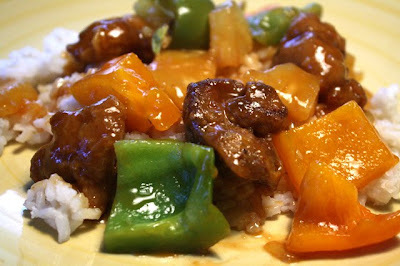 * For this Sweet & Sour Pork recipe you can leave out battered deep-frying; just do a simple stir-fry. Skipping the batter part - add 2 tablespoons of oil to a hot wok and stir-fry meat for about 5 minutes until cooked through and lightly browned. Add the sweet and sour sauce; thicken a couple of minutes, and finish by adding the veggies and pineapple, heating through.